I know, it’s been more than two weeks since the City 2 Surf, but unfortunately I came down with a bad cold the day after the race and have been resting ever since. I’m still not back to 100% yet but here it is, the run down (pun intended). Before the race on Sunday 11 August 2013 I met up with a few girls from run club who were in the same group as me, green group (just behind the elite runners and the gold charity entrants). We all checked in our gear and headed to the start line. I felt really nervous for some reason, the nerves were kicking in and I was very excited. I think it was because I had been told that after a marathon you get quicker, so I was eager to find out if that would be true for me. This was also my seventh time running the City 2 Surf, and each year I have improved my time, so I wanted this year to be even faster. Since the marathon 2 weeks ago, I had only run 3 times (1 x 7km and 2 x 5km slow easy jogs) as I had been trying to rest and let my body recover. I felt good but wasn’t sure what my plan should be for the race. I really wanted to get down to 75 minutes, which would be 4+ mnuites faster than last year, but was it possible? Anything is possible. 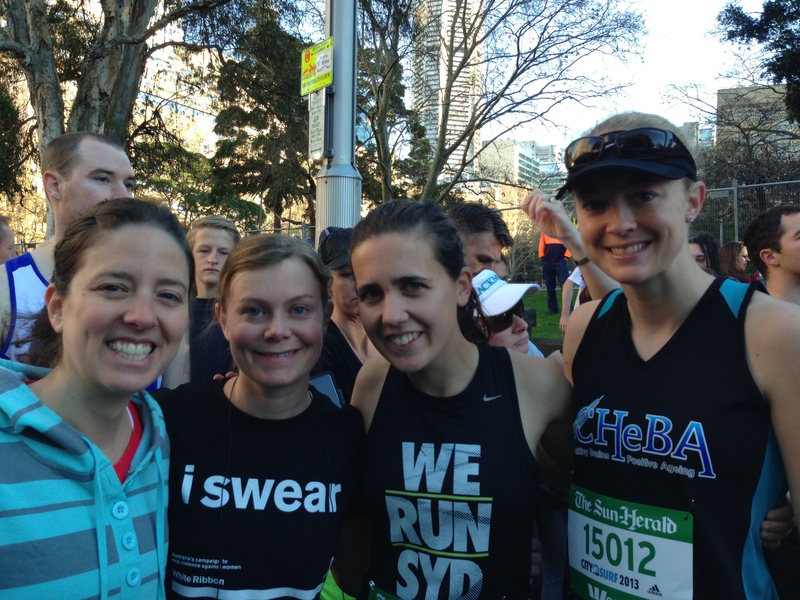 For the first few km’s I ran mostly with my friend Megan and then when we got to Heartbreak Hill I decided to beat it. I felt warmed up and I was felling strong so i powered up the hill towards the halfway point. I got into a really nice steady rhythm with my breathing and just kept passing more and more runners as I kept up my speed and stayed positive. It worked. I felt on top of the world when I got to the peak of the hill and I slowed to get some water to re hydrate. Then I was back into full swing, I was going a lot faster than i had expected but I knew I still had a bit to go yet and I had to leave a bit of gas in the tank. The weather was spectacular, if anything it was a little too warm but the blue sky and smiley faces were so nice to see. The bands played on the side of the roads and kids gave high-fives and jelly beans to the runners. It’s one of the things I love about this run, the atmosphere. For a Fun Run of 85,000 runners it sure was an enjoyable experience. And then I saw the water and beach at Bondi, I knew I was getting close and my watch told me I was on target to hit my goal, maybe even smash it. But you never know what’s around the corner and it’s still a long way to the finish line even though you can see the water. I saw some run clubbers nearing the finish, they were running as Batman & Robin, very hot in their outfits but they encouraged me to speed up and keep my momentum going instead of slowing to have a chat. So I kept pushing. I don’t normally push that hard, and have not really felt confident enough to push myself in a race before so it was a weird feeling. A good feeling. I wanted to make sure i had given it my all and that I had nothing left in the tank when i got to the end. The finish line was in sight and I pushed with all my might and energy to go as hard as i could down the last section of the course and i crossed the line in 72:21 – a new Personal Best! I was so excited at my achievement and couldn’t believe what my eyes were reading on my watch, i had done it. I had smashed my goal and I felt on top of the world. The runners high was very strong with me that day and I know that next year i’m going to have to train even harder if I’m going to beat it. 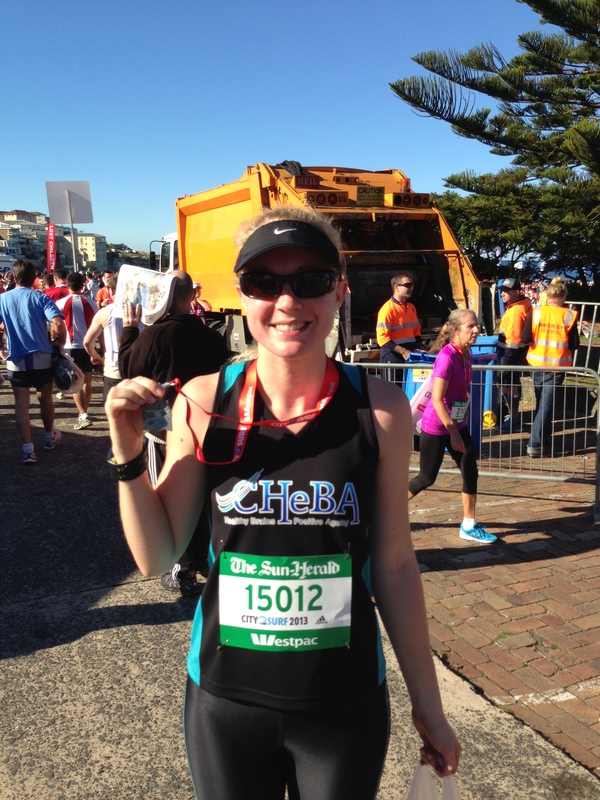 My next run will be the Blackmores Half Marathon in less than a month’s time. I think I need to get a few long runs in before then. It’s been just over a week since my first marathon and I’m feeling great. The left foot is still a little sore but it’s getting progressively better, no more bruising or swelling. On Sunday I went for my first run since the marathon and I took the dog to make the most of the gorgeous weather that Sydney turned out for us. We ran at the Centennial Parklands with a couple of the Fitness Ambassadors from UNSW CHeBA. We are currently raising money for Dementia research in the lead up to the City2Surf on 11 August (this sunday). It was a short 5km circuit with a pretty small hill and it was a good chance to stretch the legs. It was such a beautiful day so the best place to be was outside. I really enjoyed the run, but i must admit it felt a little weird not having the pressure of pushing myself for a certain distance or time. I just ran for fun and it was exactly that. I’m so lucky to be able to run! Also, last night (Monday) I also had Nike Run Club and I ran a 7km distance with the 6 minute pace group. I was paired with another run leader Sarah, and we got to chat a lot about her recent engagement and weddings plans. We realised we have a lot in common. Don’t worry, we didn’t forget about the run clubbers, they were fun too and we all chatted for most of the course. During the run we also bumped into the Red Bull crew who had music and dancing setup for us underneath the harbor bride, it was really cool to see them and helped re-energise the group for the last 3km. 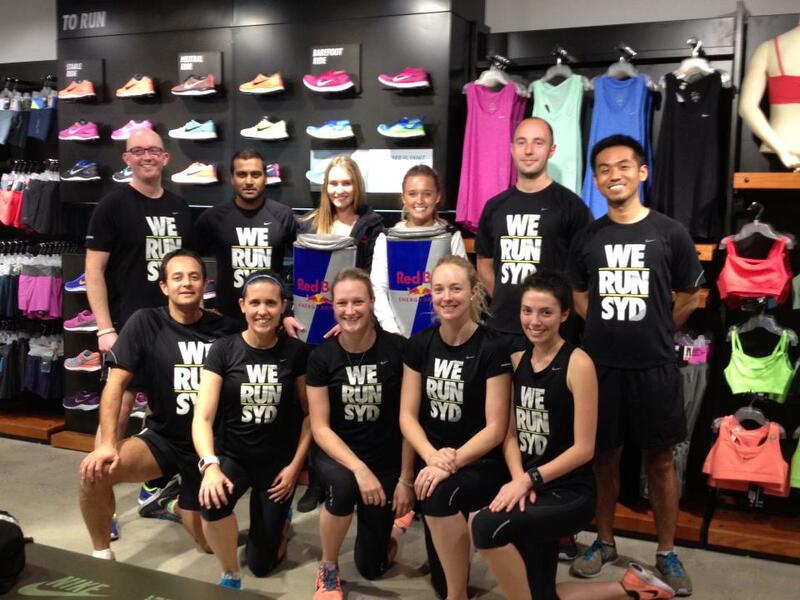 We also had a few run leader pictures taken in store and we all had a really fun night. Check out our crew, a few missing but i’m in the front row second from the right. The past few days have shown me that I still love running and that I want to do more and more of it for as long as my body will hold me up. So after my wedding in October, I’m going to start planning training and races for 2014. It’s going to be a big year and i can’t wait to set some new running goals. This Sunday is the 14km City2Surf and I’m not going to push myself too much (well, that’s the plan) and I promise to post and let you all know how I go on Monday.